Non-destructive inspection of rail-tracks is growing in importance as a consequence of the increase in axial load, traffic volume and travel speed. Ultrasonic inspection for a range of internal rail defects, mostly fatigue and corrosion induced, is carried out by a variety of different instrumentation ranging from hand-held devices, through dual-purpose road/track vehicles to test fixtures that are towed or carried by dedicated rail cars. Here we present the SFB-100/NT: a dedicated, high-performance system that is integrated in a specialized rail car for inspection of railways at up to 90 Km/hr, in segments of up to 250 Km. The SFB-100/NT, a novel Windows operated system draws on the concepts of ScanMaster’s earlier model: the SFB-100. It is designed for high-speed inspection, early detection and recording of sub-critical flaws and full documentation of the inspection for subsequent reference. The system offers real-time processing of flaws with an option for paint marking the track in regions suspect of larger defects. The main analysis is performed off-line and provides for careful segregation between flaws and spurious indications; consequently the system is allowed to collect data at a high gain setting, which reduces the risk of misdetection. The SFB-100/NT includes a full documentary record of the data collected and the setup used. These records potentially establish reference for comparative, periodic monitoring of the rail condition. Information gathered from repeated scans can be compared to study, analyze and monitor flaw propagation. High-speed rail inspection entails reduction in the overall inspection cost: less time is required to inspect a given unit track length. Furthermore, high-speed inspection requires a shorter track traffic clearance-window. If the test is sufficiently fast, it becomes possible to schedule the testing intermittently with the normal traffic on the track, offering a substantial advantage for the operational aspects of the testing. The SFB-100/NT can inspect the rail at speeds of up to 90 Km/hr, allowing for its scheduling intermittently with other rail-traffic. Test speed is the fundamental design goal for the SFB-100/NT. Both track-closure times and overall test cost reduce with increasing testing speed. Nevertheless, as discussed below, the test speed is limited by the travel time of the ultrasound in the rail, and by the distance between measurements. A combination of two physical parameters fundamentally limit the testing speed: the time required for the ultrasonic signal to traverse the thickness (or depth) of the inspected medium (including the transducers), and the measurement resolution pixel (the maximal distance allowed between consecutive measurements). In considering a common ultrasonic transducer arrangement (see below) the longest ultrasonic inspection path is associated with the ±35° probes. For UIC-60 rail (height = 172 mm) the ultrasound traverses the rail in approx. 240 µs. Including the delay within the transducer assembly, approx. 5 µs, the total ultrasonic time of flight is approx. 250 µs, limiting the pulse repetition frequency (PRF) of the measurement to 1/250 µs = 4 KHz. The measurement resolution pixel derives from the requirement for high detection probabilities – this typically requires that a defect be detected by two or three consecutive measurements. The beam spread of the ultrasound in the rail determines the limiting offset between the detector and a defect, and from this the limiting measurement pixel is determined. As an example, considering the limiting PRF specified above, and, in addition, setting the limiting pixel size to 4 mm, we arrive at the maximal possible scan speed of 4mm׳4KHz=16 m/s, or approx. 58 Km/hr. Figure 1 plots the limiting scan speeds as a function of different standard rail heights listed in Table 1. The graph considers contact probes with slides (marked “Slide Probe”), and wheel probes (marked “Wheel Probe”). The delay in the wheel medium is, by design, approximately equal to the travel time through the rail; therefore the total ultrasonic travel time from the transmitter through the rail and back to the receiver using a wheel probe is twice that required for the slide probe; consequently the maximal scan speed for the wheel probe is approximately half that for the slide probe. Table 2: Parameters for cost model. Fig 1: Maximal scan speeds as a function of resolution. Fig 2: Scan cost per 50 Km rail (decreasing line) and scan coverage per shift (increasing line) vs. scan speed. Assuming an hourly cost for running the test equipment and an hourly cost for the data processing (Table 2), we plot the reduction in testing cost per unit rail length as a function of average test speed (Figure 2). This graph shows, for the assigned cost values, a reduction of 74% in operating cost per unit rail length in increasing the average test speed from 20 to 80 Km/hr. In addition we see a linear increase in the coverage capacity with average scan speed. The latter should permit a reduction in capital expenditure as it enables coverage of the desired test lengths with fewer systems. The SFB-100/NT provides for a flexible arrangement of transducers and transducer inspection geometries and can expand to accommodate up to 16 inspection channels per rail. Figure 3 depicts a basic, 6-channel scheme (for each rail): two 0° probes, two 70° probes at opposite directions, and two 35° probes arranged in for combined pitch-catch and through transmission signal detection. This arrangement is suitable for detecting the most common rail defects, shown in Figure 4, including horizontal and vertical longitudinal defects in the rail head and web, cracks originating in the bolt-holes and transverse defects in the rail head at angles of up to 20°. We note, as described below, that unlike the traditional approach to ultrasonic rail inspection, defects are identified by a combination of indications in more than one channel. Fig 3: Basic, six-probe ultrasonic transducer scheme for rail inspection: ±70°, ±35°, 2׳0°. Fig 4: Common rail defects: clockwise from top-left, longitudinal-horizontal, star crack, longitudinal-vertical and transverse. Fig 5: The main functional blocks of an SFB-100/NT for rail testing. In addition to the six, four-channel upi-100 ultrasonic instrument array and the server, the system includes the ultrasonic transducers, the rail-mounted encoder and rail-continuity sensors, the real-time paint guns, an interface to peripheral accessories and the operator workstation devices described in the text. The SFB-100/NT is designed for high-speed inspection of rail and is required to collect large data volumes at a very high rate and store it for off-line processing. The system also requires real-time monitoring of the data-acquisition process to ensure that the collected data is valid, and a means for generating test-reports offline that can be correlated to actual locations on the rail. The SFB-100/NT facilitates these tasks: data is acquires with a high-performance instrument array. An encoder signal and rail reference points serve to synchronize the measurements with scaling and actual positions on the track. 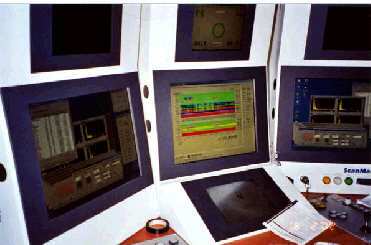 An ergonomic workstation with a compressed signal status real-time display facilitates the monitoring of the validity of the data in real time, and a powerful off-line processing program is used to screen the collected data and generate localized test reports on suspect rail regions. These features are detailed below. High sampling rate: digitization at 100 MSPS for high-resolution inspection; time measurement resolution is 10ns. Multiple hardware gates: in a ScanMaster patented design, each data channel provides up to 32 hardware signal gates. The multiplicity of gates, and their fast measurement time, enables advanced data acquisition and analysis methods in real-time. Specifically the system acquires up to 32 different signal amplitudes and their time signature for each ultrasonic channel. Peak and time measurement hardware: specialized, proprietary hardware measures the peak amplitude and its time signature for each hardware gate. This design minimizes the detection and measurement time: a critical feature for high-speed inspection. Logic state: up to two amplitude and two time logic threshold conditions can be defined for each gate. These provide for the analysis of the date in real time. Time corrected gain (TCG): to control the signal amplitudes at different material depths. This can be used to suppress strong reflections from the front-wall, while at the same time improve the sensitivity to small signals in the depth of the material. This fine depth sectioning permits the display of composite longitudinal cross-sectional images (pseudo B-scan cross-sections) of 'real' and 'artificial' flaws in the rail. It further facilitates the development and application of flaw recognition algorithms for real-time and off-line evaluation of recorded events. Fig 6: A typical upi-100 setup screen display showing two A-scan windows (with black backgroubnd) the ultrasonic setup toolbox (center), two pseudo-B-scan windows (Bottom left) the fast-access channel gain control (top right) and the status display (bottom right). Up to 8 four-channel upi-100 units can be chained together in the SFB-100/NT (Figure 5 shows a six-instrument system). These are interconnected to a central server which coordinates the operation of the entire system, and displays the status of the system status in a concise form in real time, allowing the operator to monitor the data acquisition process. The system utilizes three communication channels in parallel: two local area networks (LAN), one for transfer data in real time, and one for transfer of commands and off-line downloading of data and setup information, and a fast, dedicated bus, for synchronization (See Fig. 5). 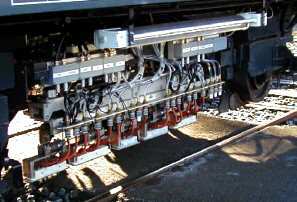 In addition the system collects data with a set of four eddy-current sensors mounted on each rail. The server module synchronizes the operation of the upi-100 modules, displays the state of the ultrasonic inspection in real-time, performs the real-time data processing routine, and collects the data from all the stations for off-line processing. A video multiplexer allows the operator to view each one of the separate channel displays. The system is synchronized with the actual position on the rail by means of a rotary encoder which ensures the required resolution on the rail irrespective of the momentary speed of the car. The system also includes rail-continuity sensors that automatically lift the transducers off the rail at rail gaps that are too large for the transducer sleds to negotiate, and a set of four paint guns to effect the real-time painting of suspect regions. Data from additional sensors including air-borne ultrasonic detectors of fish-plates, milestone and other rail markers are collected and displayed in real time on the server and stored with the ultrasound records to assist the off-line analysis and provide reference for identifying suspect rail-regions in the field. Fig 7: shows the operator workstation, including the screens for the server and two multiplexed ultrasonic instruments. The main MMI console and flaw display, including a keyboard, a touch-screen, and a pointing device. The console displays the compressed, color-coded status of all the active channels, as well as the external sensors. The operator can monitor the validity of the data acquisition process and can take corrective measures in real-time whenever faults are identified. Actions range from changing a channel’s gain thru over-riding the automatic rail-height setting, to interrupting the scan to correct a mechanical problem with the transducers. The touch-screen controls provide fast-access commands to the setup (change channel gain, change rail-height setting etc.). Two multiplexed screen displays, one for the left-rail transducers and the other for the right-rail transducers. Each ultrasonic channel can be displayed in one screen or the other. These screens include separate controls to select the desired channel for viewing. The control console and display – for controlling the motors pistons and valves of the carriage. Two windows inset in the floor for direct viewing of the transducers on the rail. The server’s monitor displays a multi-channel composite, flaw location display for each rail for monitoring the test’s progress (Fig. 7). Through the server the operator controls the test process, including start / stop of a test, entry of landmarks along the rail being tested (locations of crossing, milestones etc. ), and setup of the scan features (resolution, selecting setups etc.). Although the SFB-100/NT can accommodate both wheel probes and sliders, for higher speeds transducer sleds are preferred. Figure 8 shows a transducer carriage with such sliding contact transducer bublers. The slide can be manually adjusted for lateral position and angle with respect to the rail. Each slide is pressed against the rail surface with a pneumatic piston. The carriage includes two servo-motor adjustments: the separation between the two central slides can be adjusted to accommodate the variation in rail height for the ±35° probe arrangement. The carriage is lifted entirely off the rail when a large gap in the rail is detected or when the system is being transferred between scanning sites. Fig 8: A five-sled arrangement shown lifted off the rail. Some of the sleds include two probes for a total of seven ultrasonic probes. A four- sensor eddy current probe (not shown) is similarly mounted. For each UT channel, the peak amplitude and time-of-flight of every signal crossing the threshold of each gate is stored on the high-capacity hard disk of the upi-100. In parallel this data is transferred in real time through the fast bus to each server for real-time processing. On completion of the scan, the data that is accumulated on each upi-100 is transferred off-line either to the Server computer or to a remote Process station for off-line processing. The process mode screen display (Fig. 9) serves for interactive inspection of the recorded data. The operator can zoom, pan, search and identify (run a criterion filter over the data to automatically search for indications and flaws) and generate reports. After manual verification a report of the flaw positions is generated (Fig. 10) to assist an inspection team sent to the field in locating the indication and verify the detected flaw. 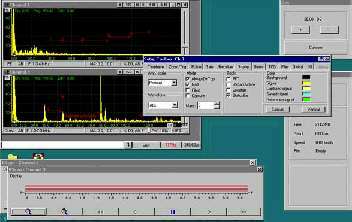 Fig 9: A typical Process screen showing psuedo-B-scan display for the two tracks. Indication are plotted at the length (time) of detection. Fig 10: A typical process report for flaw locations.. The SFB-100/NT is a high performance, fully integrated system for testing railways at high speed, high reliability and maximal operator convenience. The system can run at up to 90 Km/hr, allowing for its operation intermittent with ordinary track traffic without the need to shut down track portions for the test. The SFB-100/NT also provides full documentation of the test such that any defects can be detected at an early stage, monitored over a several inspections and corrective measures planned ahead. Several of the features offered by the SFB-100/NT are invaluable for this scheme: the multiple gates used permit the detection of flaws in the vicinity of other rail artifacts (bolt- holes); the full data capture for off-line analysis and the accurate, high scale zoom of the resulting B-scan image patterns.